Mario's Early Years! 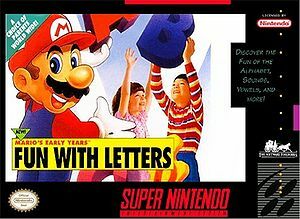 Fun with Letters is one of several educational games of the Mario franchise. Developed and published by The Software Toolworks and licensed by Nintendo, this game was released for the PC in 1993 and Super Nintendo Entertainment System in 1994. It was produced as a predecessor to Mario's Early Years! Fun with Numbers and Mario's Early Years! Preschool Fun. The concept of all three games is largely identical; they only differ in which tasks the player has to fulfill. Mario's Early Years! 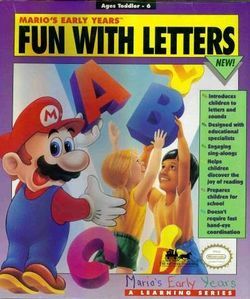 Fun with Letters is a Mario-themed educational game and is intended to teach the basics of the English language to young children. 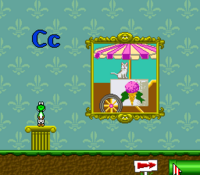 The game gives the player the option to play either as Mario or Princess Toadstool. Which character is chosen does not affect gameplay at all, and is purely a matter of personal taste. The player controls the character indirectly by moving a cursor over the screen. By clicking somewhere on the screen, the player can make the character move to that spot. Clicking on an object will make the character interact with the object. The game begins on a selection screen, from which every world is accessible. The screen shows a view of the ocean and an archipelago of seven islands with various objects on top, representing the seven worlds of the game. On the bottom screen there is a raft carrying the three playable characters. The player can switch between characters here. 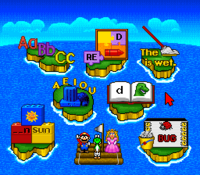 The player is shown the alphabet in Alphabet World. Each world in the game presents a specific task to the player. These tasks range from filling in words to complete sentences, finding words that contain a specific sound, or aligning three objects that start with the same letter. The player usually has to pick the correct solution out of three or four options in order to complete the task. Each world features different rooms accessible through pipes, presenting slightly varying options and tasks to the player. Each task can be played in two different ways. They can either experiment freely with the given options, or they can wake up the sleeping Luigi in each room by clicking on him, who will then watch the player's actions. If Luigi is awake, he will compliment every right decision the player makes, and sometimes other characters will show up. Giving a certain amount of right answers makes the player advance to the next room, and eventually clear the world. However, since the game keeps no record of completed tasks, this does not serve any purpose. The seven worlds of the SNES version. Other than most Mario games, Mario's Early Years! Fun with Letters features voice acting for all of its dialogue. The narration is done by a child's voice, with prerecorded words pasted together to form sentences. Luigi also speaks a few lines during the game's tasks. His dialogue is not pasted together, though. The soundtrack of the game features original and remixed versions of Super Mario World's music, and also some common nursery rhymes like Twinkle Twinkle Little Star and Itsy Bitsy Spider. The sound effects of the game have been taken from Super Mario World as well. The SNES version of the game is largely the same as the PC edition, but with some differences due to reduced space. Options to turn off music/sounds/voice clips, randomize the questions, and show text in worlds that have it were removed. The help screen with tips on how to continue learning outside of the program was removed. Yoshi was added as a third playable character. Alphabet World lost a second game mode where the sounds of letters are learned. Building World is different from its PC counterpart. On PC, it involves the Mario crew at a baseball match. Sing Song World is a world where nursery rhymes/children songs are reenacted with the Mario cast. They are the aforementioned Twinkle Twinkle Little Star, If You're Happy And You Know It, The Alphabet song (A song recalling the letters of the English alphabet to the tune of Twinkle Twinkle Little Star) and It's Raining, It's Pouring. Story World is a world where two stories are read aloud. One involves Mario, Luigi and Bowser in a mud puddle and the other involves Princess Toadstool and a pig. In the "Pig Out" story of Story World, one of the sentences reads, "Mario and Luigi cannot let the Princess Toadstool get the pig." In said sentence, the first instance of the word "the" is an unnecessary addition to the sentence structure. This page was last edited on December 19, 2018, at 01:41.